This Monday morning bright and early (I woke up at 4:00am) we drove Alex to Itami airport and saw him off. It was great having him with us for 2 weeks and I hope he enjoyed it as much as we did. 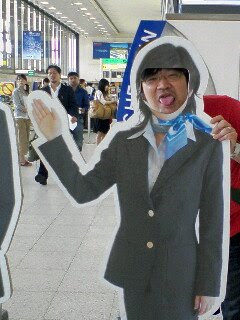 Here's a pic of Shoichi at the airport. I almost had to force him to pose for it. PS- I put up another new post on Let's Signing!